Meet Dr. J. Alex Bell, Jr. Many dental professionals consider implant-supported crowns or bridges an effective and long-lasting solution to the pain and reduced quality of life experienced by patients with missing or severely damaged teeth. They’re a more realistic-feeling alternative to dentures and fixed bridges, allowing people to enjoy their favorite foods and smile with confidence. Despite the benefits, many people aren’t sure whether dental implants are right for them. Dental implants are a permanent replacement for missing teeth. The process starts with a dental professional surgically inserting a titanium root, or post, into the jaw bone where the natural tooth was. After the jaw and post fuse together and provide a sturdy base, an abutment is placed on the post. The abutment is then fitted for a single synthetic tooth, also known as a crown, or a bridge, which is then affixed to the abutment. Implants can also be used in conjunction with dentures. In the case of implant-secured dentures, specially designed abutments are affixed to the dental implant and the corresponding attachment is affixed to the dentures in the appropriate spot. Once the implants are fully integrated with the bone, the dentures can be snapped on top of the abutments for a solid, slip-free fit. Teeth that are damaged beyond the capabilities of restorative dental care often benefit from replacement with dental implants. This occurs when a crack or chip has broken through the enamel and damaged the root. Extracting the tooth and replacing it with a dental implant prevents infection and further damage to the surrounding gums, teeth and jaw. Not only are missing teeth a source of insecurity and discomfort, but they can lead to structural issues. When a tooth falls out, the neighboring teeth begin to shift and fill in the leftover space. Resorption, which occurs when the jawbone shrinks away due to lack of root stimulation, is another common issue. Both issues can affect a person’s bite and speech, which is why missing teeth should be replaced as soon as possible. Jawbone resorption can also have a dramatic aesthetic effect on facial appearance, resulting in a sunken appearance around a person’s mouth. When any of these issues occur and repair isn’t a viable option, your dentist may deem extraction and replacement the best course of action. A lesser-known benefit of dental implants is they can actually provide patients with more bone density if they’ve experienced bone loss. A dental professional can perform a bone graft on the jaw bone prior to inserting the post if necessary. Additionally, the titanium post will bond with the jaw bone, creating additional mass after the procedure. You may have all of your teeth and they’re not damaged in any way. However, if you have difficulty speaking, chewing or you have to avoid certain foods, you may benefit from dental implants. Conditions like bruxism, temporomandibular joint dysfunction (TMJ) or natural changes to your teeth can be improved with dental implants in some cases. 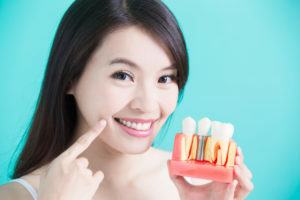 If you’re experiencing any of these warning signs or, if you have questions about dental implants, it’s important you work with caring, knowledgeable professionals who can accurately answer your inquiries and ensure you get the most out of your new smile. The staff at Family Dental Associates perform single tooth implants, All-on-4® treatments and offer other dental implant services, so you can rest assured we have the experience and tools necessary to help you choose the option that’s right for you. For more information about what dental implants can do for you, call (478) 971-7701 today or visit our website.